OK, I have to admit I caved and started a new project before finishing everything on my list. At least I got close. I finished both little tumblers but one still needs to be washed. The Spiderweb is bound but needs to be washed and blocked and the other Bento Box is ready for quilting. Photos of all this later. For now…I had one yard of fabric with 8 stripes of different prints–and a new Kaleidoscope ruler I wanted to try. 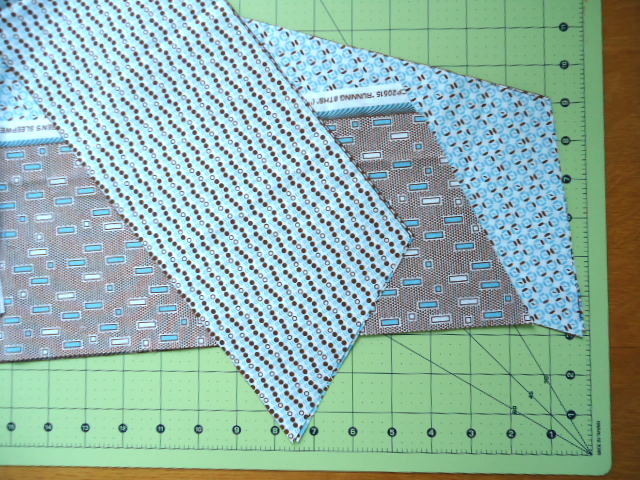 I forgot to take a photo of the fabric before I cut it apart. I was never in love with this fabric so this was my trial run with what I thought might be a tricky pattern with lots of lumpy joins. I learned a bit but am happy enough to do another one–very scrappy next time. Still thinking about borders and I will piece a back but here it is so far. 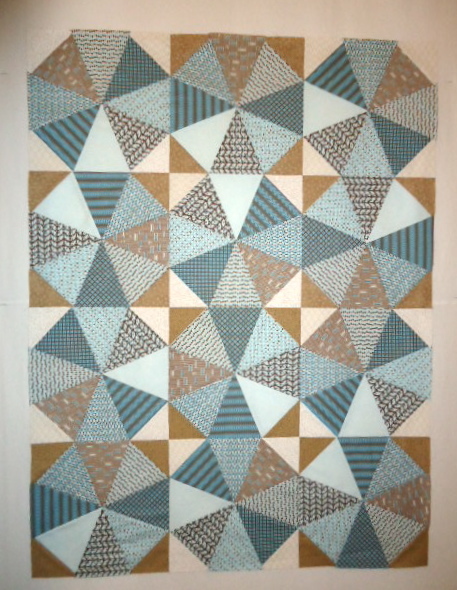 It will be a donation quilt. I had to find a substitute fabric (the very light one) in my stash because one of the original fabric strips was narrower than the rest. I plan to use it on the back though. And while I was cheating on new projects, I started playing with the fish fabrics my friend Carol gifted to me for donation quilts. If this one turns out OK, I will try to sell it and donate the proceeds to the Panama Canal Quilters. They help fund school expenses and enriching extracurricular activities for indigenous children who meet grade requirements and whose parents play an active supporting role. 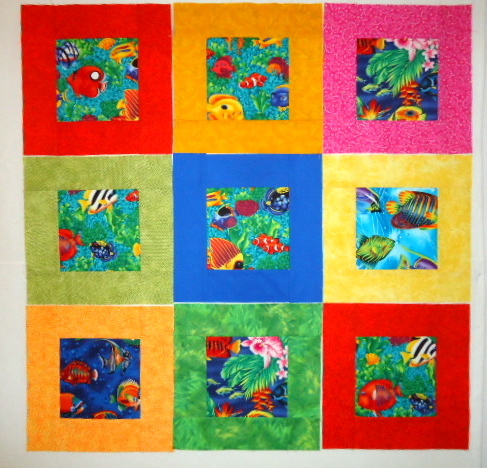 This entry was posted in community service quilts, kaleidoscope quilt, quilting and tagged community service quilts, kaleidoscope quilt, quilting. Bookmark the permalink. Cool projects! I love the kaleidescope – so calm and comforting. I LOVE the kaleidoscope – I kept thinking it looked familiar then it dawned on me it is a straight sided Winding Ways! When you are here remind me to show you my Lucy Boston book (the Patchwork of the Crosses English lady.) She did a fabulous scrappy kaleidoscope. The fish are so cute and bright! And you are so generous to donate the funds to our girls. Great quilts! Life is too short not to start new projects!!!! Love your Kaleidoscope! It’s one of my favorite patterns. Love the vivid colors !